Some people may query the logic of implementing software to enhance the Exchange 2013 spam filter. After all, the default Exchange 2013 anti spam mechanisms are fairly good. Furthermore, when you add the premium features of Microsoft´s Exchange Online Protection (EOP), the Exchange 2013 anti spam mechanisms are easy to manage. However, despite the premium features, some spam emails still manage to avoid detection. The reason for this is because spammers are getting more sophisticated. Despite adding Content Filter Agents, Sender Policy Frameworks and Recipient Verification Protocols to the Exchange 2013 anti spam mechanisms, spammers are still finding a way through Microsoft´s defenses. One feature that could substantially reduce the volume of spam emails avoiding detection is Greylisting. Greylisting is a front-end anti spam mechanism that works by returning each inbound email to the server from which it originated. The returned email is accompanied by a request for the email to be resent, and usually the request is answered within a minute or two. Servers sending out spam emails do not have the time to respond to requests to resend emails because they are too busy sending out fresh spam. The request to resend the email is ignored until it times out, and the spam email is never received again by the server using the Greylisting process. Although it can slightly delay the delivery of genuine emails, Greylisting substantially reduces spam email. The Exchange 2013 spam filter (with EOP) is estimated to detect 99% of spam emails. The actual percentage will depend on what Spam Confidence Levels have been set by the system administrator. The problem with tweaking Levels higher to detect more spam emails is the Exchange 2013 anti spam mechanisms then start blocking genuine emails and quarantining them in error (false positives). Because the Greylisting process eliminates spam emails from previously unknown sources, email filters with Greylisting achieve spam detection rates of 99.97% without having to increase Spam Confidence Levels. For a business being sent ten thousand spam emails each week, Greylisting will reduce the number of spam emails avoiding detection from one hundred to three. The benefits of software to enhance the Exchange 2013 spam filter can be significant. Each spam email that avoids detection potentially carries a threat of phishing, malware or ransomware. By reducing the number of spam emails that evade detection, a business that has implemented software to enhance the Exchange 2013 spam filter also reduces its exposure to risk. A reduction in spam emails also results in an increase in productivity. Various studies over the past decade have put the cost of lost productivity due to dealing with spam emails at up to $1,000 per employee per year. It may only take a few seconds for a security-conscious employee to identify and delete a spam email; but, for a business with a thousand employees, the loss of productivity is huge. SpamTitan´s Exchange 2013 anti spam software provides an extra level of defense against email-borne threats. As well as including Greylisting among its feature-set, SpamTitan´s Exchange 2013 anti spam software includes SURBL filters and malicious URL detection to mitigate the threat from phishing, and dual anti-virus software to check the content of both inbound and outbound emails. Simple management via a centralized, web-based administration portal. Allows different policies to be applied for different domains. Synchronizes with LDAP and Active Directory. A choice of gateway or cloud-based deployment. Whitelist or blacklist senders and attachment types. Compatible with all operating systems and infinitely scalable. The most effective way of improving email security is through defense in depth. By using layered defenses, organizations can greatly enhance their security posture against rapidly evolving malware variants and sophisticated new phishing tactics. SpamTitan uses several predictive methods for detecting new threats, such as subjecting each incoming message to a Bayesian analysis. Machine learning and heuristics also help to greatly improve detection rates to prevent malicious and unwanted messages from reaching users’ inboxes. Microsoft’s Exchange Online Protection and Office 365 incorporate several mechanisms to detect spam email and malware and phishing threats, but many of these dangerous emails are not detected and end up being delivered to mailboxes. 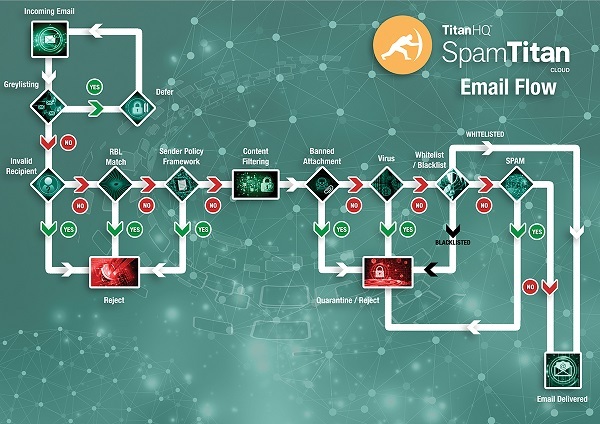 Organizations that deploy SpamTitan add an extra layer to their email security defenses and as a result, block more spam and prevent sophisticated email threats from reaching end users’ inboxes. 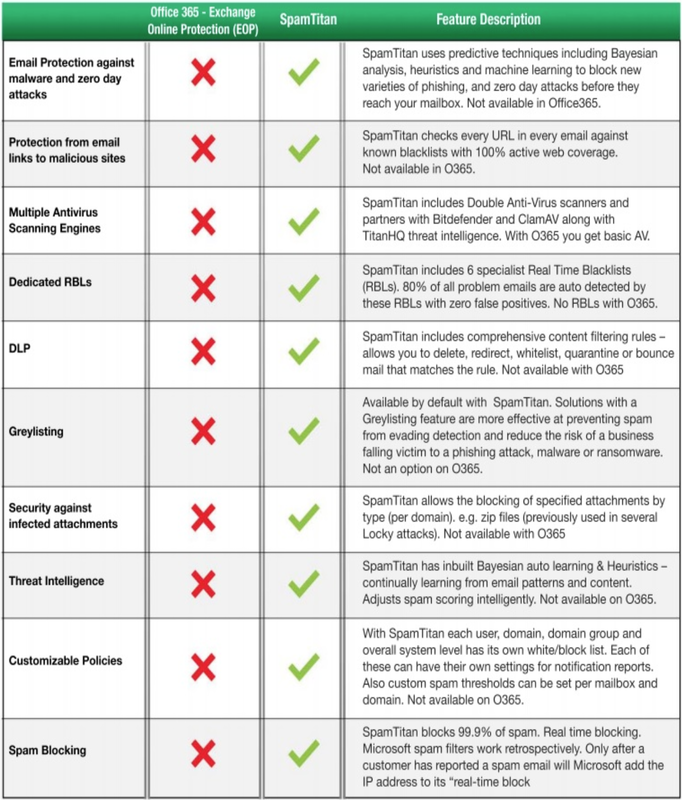 SpamTitan includes SURBL filtering, Bayesian analysis, machine learning, malicious URL detection mechanisms, greylisting, and dual anti-virus software engines – all features that are lacking in Exchange Online Protection and Office 365. If you are not content with the number of spam emails avoiding detection by the Exchange 2013 spam filter, you are invited to take a free trial of SpamTitan to evaluate its merits in your own environment. Deployment of our Exchange 2013 anti spam software takes only a few minutes; so, if you were to contact us today, you could be enjoying virtually spam-free inboxes within the hour. If you find SpamTitan is the ideal solution for enhancing the detection rate of the Exchange 2013 spam filter, we offer a competitive range of subscription options. Typically these work out to be less than $10 per employee per year – considerably less than the cost of loss productivity, and potentially saving your business from a phishing, malware or ransomware attack that could have far more serious implications.